As consumers continue to demand more from their mobile devices, this has created an exceptional increase in data traffic and is pushing never before experienced pressure on the mobile network. At the same time, mobile operators are looking to increase the size of their network and modernize the ‘pipes’ that carry traffic from the cell towers to the network and upgrade the backhaul from TDM lines to Gigabit Ethernet, performance assurance is key in this complex challenge. Accedian Networks’ solutions assure, optimize and improve the performance of the mobile backhaul networks and deliver best-in-class traffic shaping, micro-second delay and delay variation measurement, hitless throughput and remote loopback testing. With this growth, there has been an industry wide push to modernize the pipe that is carrying traffic from the cell tower to the network. At the same time mobile operators are looking to increase the size of their networks, and are moving to upgrade the backhaul from TDM lines to Gigabit Ethernet. Although Gigabit Ethernet solves the capacity issue, it requires an added ingredient to be as stable and predictable as TDM: Performance Assurance. Accedian’s family of Performance Assurance Elements enable end-to-end service provisioning and assurance with carrier grade performance, while delivering the most comprehensive remote test and performance monitoring, service creation and traffic management capabilities that enable premium services backed by assured SLAs. Accedian solutions’ unique hardware-based architecture delivers the most precise in-service measurements available, all without adding delay or delay variation to pass-through traffic. There are many companies talking about ITU-Y.1564, but in order to really be able to deliver upon the needs of the service providers, Accedian has a unique approach to using ITU-Y.1564 as we have been a strong advocate of this standard for many years. 1) Capable of defining the network attributes of up to 8 concurrent flows independently. This provides the operator with the flexibility to adapt testing to their customers specific service needs. 2) Centralized management of testing enables full control all the end points that make up the test, thus increasing the productivity of the technician. 3) Accedian’s patented timing distribution techniques allows our performance assurance elements to generate highly accurate one-way delay measurements and fully integrates into the network timing, thus providing easy access to timing services. 4) Fully integrated and deployed in the networks, Accedian’s ITU-T Y.1564 implementation does not require the allocation of special IP addresses. 5) Ability to run testing regardless of the time of day/location. Makes in-service testing and remote testing easy and saves truck-rolls. 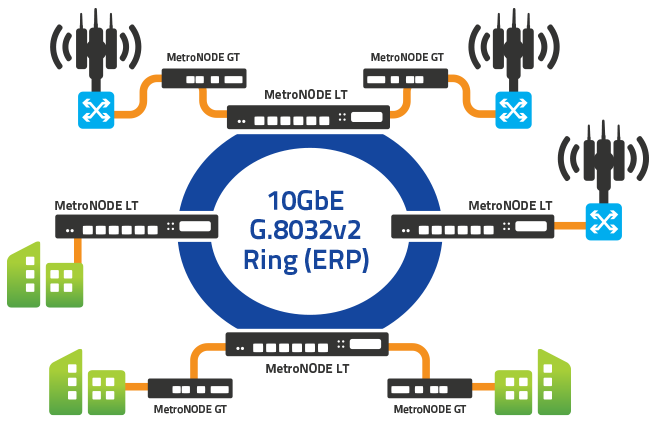 Accedian’s MetroNODE 10GE™ and MetroNID GT™ solutions deliver high speed protection. Based upon ITU-T G.8032v2 with sub 50ms failover switching, the Accedian solutions can be used to extend highly resilient protected Ethernet services to support applications, such as mobile backhaul. The G.8032v2 support for the MetroNODE 10GE and MetroNID GT™ can be used as a standalone to deliver protected 10GbE or 1GbE services to cell sites or subscriber locations. Optimized for multi-site, ring or mesh network and multi-service performance testing, Accedian solutions effectively scale to meet the capacity demands of mobile operators, cable operators and service providers who are implementing mobile backhaul services.